Famed for its foodie scene and impressive architectural wonders, Italy is often overlooked as a beach destination. However, ignoring Italy’s beaches would be a serious error. The country is studded with seaside towns with sand and stone beaches which plunge into turquoise seas. Here, we’ve rounded up some of the very best! 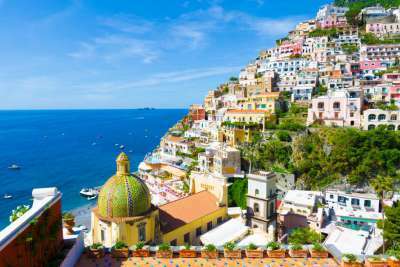 Positano, is arguably, Italy's most famous beach town. Its pastel-coloured houses staggering away from deep blue seas are sprawled across many a postcard. The town's pebble-beach is clad with fashionable Italians and visitors to the country, who cradle ice creams on sunny days. To blend in with the locals, we recommend sipping a glass of Prosecco from one of the many harbour-side restaurants. 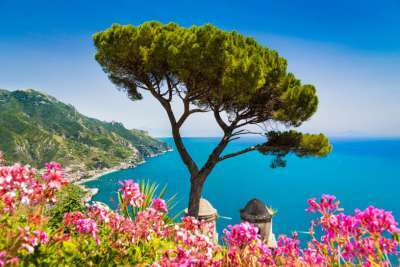 Famed for its designer boutiques and lavish restaurants, the rugged island of Capri has carved out quite the name for itself. 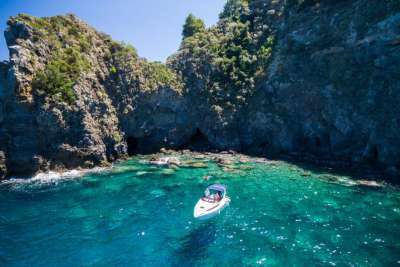 Away from the islands' main town, however, there are a number of small coves where all you'll need is your swimming costume and a towel. When you tire of beach life (if that's at all possible), you can always spend an afternoon exploring the famous Blue Grotto: a cave whose waters shine an iridescent blue. Tuscany is known for its famed crooked buildings and sprawling wine region. 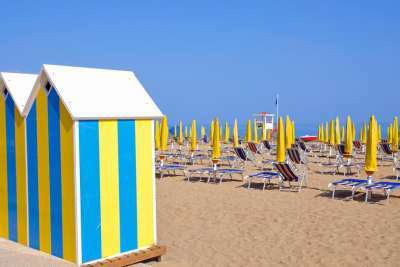 However, away from the rolling hills and truffle-growing regions, lies the chic beach town of Viareggio. Here, rows of multi-coloured deckchairs adorn golden sands, and children and adults alike scream and cheer through games of beach volleyball. Each winter the city springs to life for the advent of its carnival, where impressive floats and dancers stomp through its main streets. 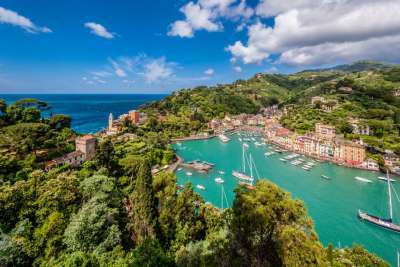 Over on Italy's Ligurian coastline, on a peninsula almost to itself, sits the former fishing village of Portofino. Whilst this village might be small, it certainly packs a punch with multi-coloured houses huddling around a yacht-filled harbour. This area used to play host to A-list guests such as Elizabeth Taylor and Frank Sinatra and with dazzling good looks it's not hard to see why. Beyond the village, there are a mixture of petite pebble-laden beaches where you'll mingle with locals, and large swathes of sand where you can make a base for the day with a deckchair and a good book. Just an hour's ferry ride away from the fascinating but chaotic city of Naples, sits the tiny island of Ischia. Whilst Ischia may be the biggest of the islands that dot the Bay of Naples, it is in no way large. This is a destination where boutique hotels, gelaterias and bars cluster around some of the softest sands in Italy. Cloudy days in Ischia needn't mean a day out of water: volcanic waters bubble up in hot-tub-esque pools in the Sorgeto region. Venice may be known for its winding waterways, singing gondola drivers and romantic atmosphere but it also has a great beach. 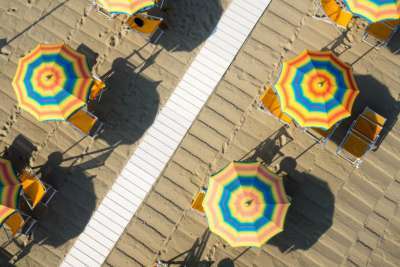 The Lido di Jesolo lies just outside of Venice and has over 15 kilometres of gold sands sloping gently into the sea. The hotels here tend to be family friendly and each will lay claim to its own patch of beach but with so much to go around, it still feels roomy. Families won't have to worry about keeping children occupies as there is an aquarium, zoo and waterpark nearby. 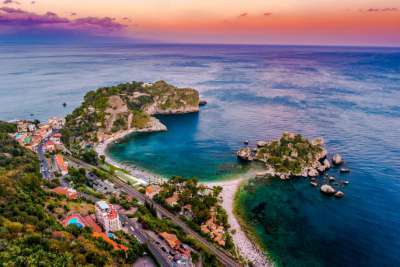 Sicily may be famous for its dramatic history but it's a holidaymaker's paradise with jaw-dropping palaces, beautiful beaches and of course, the looming Mount Etna. Taormina is, probably, the most famous of Sicily's beach resorts and it's not hard to see why. There is the ancient Greek amphitheatre where concerts and plays are still performed, winding cobbled streets and a beach that has to be accessed by funicular - there's a certain romance to that. The beaches here are largely sandy and plunge into crystal clear seas. 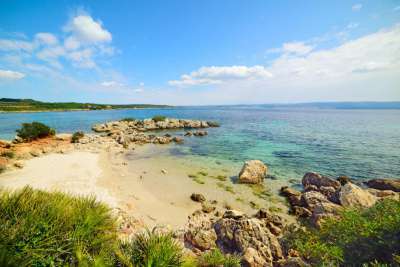 The island of Sardinia is graced with soft white sands around its perimeter, and the pretty village of Chia has some of the very best. Some of the area's best beaches require a bit of a walk away from the main action but this means that on arrival you'll be rewarded with fewer crowds and true natural beauty. We recommend Porto Campana where flour-soft sands make way for turquoise seas. Chia is a hit with both surfers and divers alike, who head here to explore the archaeological wonders that can be found below the surface. 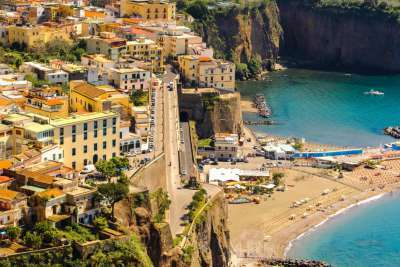 The town of Sorrento sits vertiginously atop a clifftop overlooking the dramatic sweep that is the Bay of Naples. This is a great spot from which to explore the ancient ruins of Pompeii, but for days when there's nothing you'd rather do than kick back with a good book, there are a whole host of beaches to choose from. The beaches here are small but there are plenty of them! You can choose between private beach clubs where you can pose for photos with a cocktail, or a more natural offering. Whilst Taormina may draw in the crowds on Sicily's coastline, there are smaller, picturesque beach resorts to explore too. 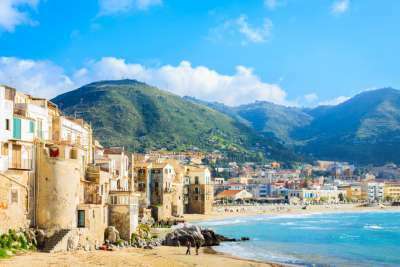 Cefalu is one of these such resorts. The beach here is graced with soft golden sands that slope gently into clear seas, making it a great spot for families. Away from the beach, climb the mountain of La Rocca for jaw-dropping views of the surrounding area.